Transparency Market Research (TMR) has published a new report titled ‘Veterinary Vaccines Market - Global Industry Analysis, Size, Share, Growth, Trends, and Forecast, 2018–2026.’ According to the new report, the global veterinary vaccines market was valued ar above US$ 6,100 Mn in 2017 and is projected to expand at a CAGR of almost 6.5% from 2018 to 2026. Rise in demand for preventing animal to human transmission of diseases and increase in the dependency on livestock animals for the growth of economy are likely to boost demand for veterinary vaccines during the forecast period. 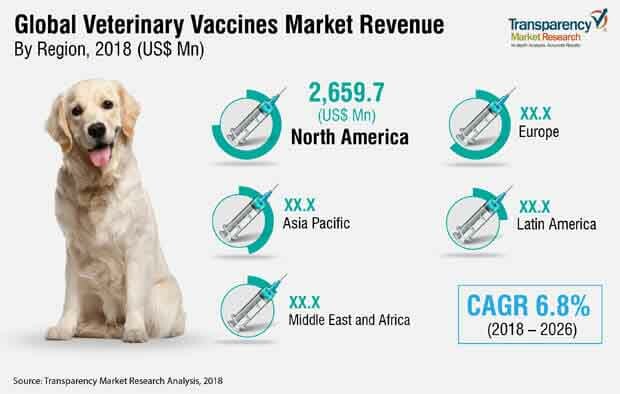 North America and Europe are likely to dominate the global veterinary vaccines market due to high spending on animal health care and rise in focus of key players on the development of new vaccines in the market in these regions. Increase in ownership of companion animals and rise in prevalence of animal to human transmission of diseases in countries such as Japan and China are likely to boost the veterinary vaccines market in Asia Pacific in the coming years. Governments play an important role in the distribution of animal vaccines. For instance, the government of India purchases FMD vaccines from manufacturers in bulk and supplies it in different regions of the country. Bulk purchase of FMD vaccines results in reduced prices. This is anticipated to hamper the growth of the FMD vaccines market. The report offers detailed segmentation of the global veterinary vaccines market based on technology and animal. Based on technology, the live attenuated vaccines segment is projected to dominate the global market due to the presence of major players in the segment. However, the segment is expected to lose market share during the forecast period as live attenuated vaccines show resistance against various viruses and are unable to protect animals. The others segment, which includes vaccines such as DNA vaccines, is anticipated to gain market share. Its share is anticipated to rise from 9.0% in 2017 to almost 10.0% in 2026 due to increase in research and development by major players to develop recombinant vaccines in order to combat animal diseases. In terms of animal, the livestock segment is projected to account for a dominant share of the global veterinary vaccines market during the forecast period. The segment is likely to expand at a CAGR of above 6.0% from 2018 to 2026. However, the segment is expected to lose market share in the coming years due to a decrease in the number of farm animals in some regions. The companion segment accounted for 24.0% share of the global veterinary vaccines market in terms of value in 2017. The segment is anticipated to expand at a rapid pace in the near future. The market share of the segment is likely to rise to 25% in 2026. Rise in pet ownership and increase in spending on pet healthcare are likely to propel the segment during the forecast period. In terms of value, North America held a major share of the global market in 2017. This is due to high pet health care expenditure and rise in awareness about the advantages of vaccines to prevent diseases, especially in livestock animals among breeders in the U.S. Furthermore, presence of several players such as Zoetis Inc. and Merck Animal Health that invest significantly in research and development to formulate new vaccines in order to prevent animal diseases is projected to propel the veterinary vaccines market in North America from 2018 to 2026. Rise in the incidence of livestock animal diseases in countries such as China and India and rise in per capita pet health care expenditure are anticipated to drive the veterinary vaccines market in Asia Pacific. Economic growth in countries such as Brazil is increasing pet health care spending. Moreover, Brazil is the second position for beef production in the world. Production of livestock animals is high in the country. The government of the country has implemented measures to take care of livestock animals. This is likely to drive the market in Brazil in the near future. These factors are likely to propel the veterinary vaccines market in Latin America. The market in the region is expected to expand at a CAGR of above 7.0% from 2018 to 2026. The report provides profiles of leading players operating in the global veterinary vaccines market. They include Boehringer Ingelheim GmbH, Merck Animal Health, Zoetis Inc., Eli Lilly and Company, Bayer AG (Bayer Animal Health), Ceva Santé Animale, Virbac, Biovac, Neogen Corporation, and ImmuCell Corporation. Market players adopt strategies such as expansion of product portfolio by developing new products or through acquisitions and licensing agreements. For instance, in May 2017, ViroVet NV, a Belgium-based biopharmaceutical company that develop vaccines for livestock animals, entered into a collaboration agreement with GALVmed. Under this collaboration, ViroVet NV extended its vaccines pipeline for small ruminants by utilizing GALVmed’s technology platform. Other key players are also adopting similar strategies.